What Makes Innovations Sticky and Contagious? For those who live through winters where the temperature drops below the freezing point of water, it’s a frustrating and very real problem. I personally solve this problem by covering the windshield and wipers with a gray, black and white snow leopard patterned sheet called FrostGuard. Others, like in the picture shown above, do something elegantly simple: Elevate the wipers so they aren’t wedged down at the base of the windshield. This keeps the wipers free and makes cleaning the windshields after a snow storm easier. The wipers themselves aren’t caked in ice and are more useful on the ride home. What is fascinating, is that this phenomenon perpetuates itself. Just a couple years ago, I seldom saw this phenomenon. Now, drive into a parking lot with impending snow and ice, and rows of car wipers salute me! So, why does this practice catch on? To answer this, let’s look to Jonah Berger’s, “Contagious:Why Things Catch On.” and “Made to Stick:Why Some Ideas Survive and Others Die” by Chip and Dan Heath. Practical -Practical is better than obtuse. Social Currency – Dude, I know how to make the PSWC. Am I cool or what? 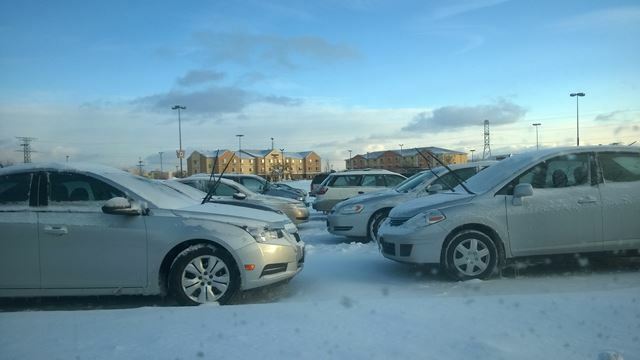 Unexpected -Whoa, check out the wipers standing in the rows of cars! Triggers – It’s going to snow while I’m in the office (or shopping center, or…). Time to do something about it now so I don’t pay for it later. Concrete – Just lift the wipers. How easy is that? Emotion – We’ve all felt biting winds and frozen body parts while scraping ice off of windshields and cursed under our breaths when the wipers don’t clean the windows, even after we’ve sprayed a ton of wiper fluid! Stories – This whole post is talking about this concept. But the real story is told each time someone walks into a parking lot: Once upon a time, a winter storm was coming. As you exit your car after parking, you see multiple cars with wipers proudly standing perpendicular. You go into the office. Meanwhile, snows came and they were terrible! When it’s time to leave, you’re greeted by a blast of arctic as you walk into the parking lot. While you and others get frost bit, and curse over howling winds while cleaning your windshields, Wiper People spend less time in the cold, and are actually able to see out their windshields on the drive home. And they lived happily ever after! We can watch them and marvel, or we can ride them to the stars. He piloted human innovation at the cutting edge and was rewarded with the wonder of seeing four sunsets in a day. If you want to innovate, go where someone else has never been. Make the trail. Make your way. Explore. Prototype. Test. Don’t just dip your toe into the water. Dive into the waves. Be part of the experience. Empathize. Understand. The New begets The New. Multiple possibilities exist. Don’t try and predict it. In the certain-ness of uncertainty, Make the Future. Fear blinds. Fear creates hesitation. The New is needed, now. The world needs you to be fearless. Live. Don’t look back. Look forward. Look up, down, left, right, and within. Learn. Learn what works, what doesn’t, and why. Learn from great teachers. Be a great teacher of Innovation! God Speed on Wings of Angels, John Glenn.